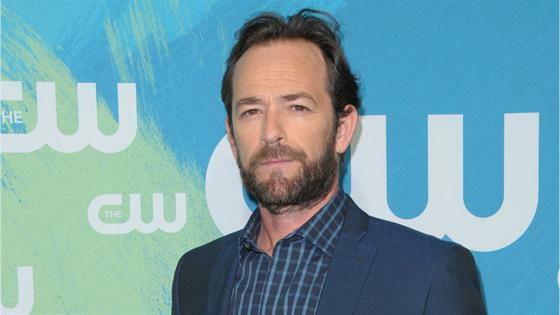 Luke Perry, star of Riverdale and a former Beverly Hills, 90210 heartthrob, has died at age 52 after suffering a stroke. The actor passed away on Monday morning, E! News has confirmed. He was surrounded by his children Jack and Sophie, fiancé Wendy Madison Bauer, ex-wife Minnie Sharp, mother Ann Bennett, step-father Steve Bennett, brother Tom Perry, sister Amy Coder, and other close family and friends. "The family appreciates the outpouring of support and prayers that have been extended to Luke from around the world, and respectfully request privacy in this time of great mourning," his rep tells E! News in a statement. "No further details will be released at this time." Riverdale executive producers Roberto Aguirre-Sacasa, Greg Berlanti, Sarah Schechter and Jon Goldwater, along with Warner Bros. Television and the CW, released a statement following Perry's passing. "We are deeply saddened to learn today about the passing of Luke Perry," the statement reads. "A beloved member of the Riverdale, Warner Bros. and CW family, Luke was everything you would hope he would be: an incredibly caring, consummate professional with a giant heart, and a true friend to all. A father figure and mentor to the show's young cast, Luke was incredibly generous, and he infused the set with love and kindness. Our thoughts are with Luke's family during this most difficult time." Perry, who hails from Fredericktown, Ohio, was born Coy Luther Perry III. He moved to Los Angeles after high school to pursue acting. He spent two years there before moving to New York, where he lived for three years and appeared on a season of the soap opera Loving in 1988. Perry, who hated his boss, then moved back to Los Angeles, according to the Washington Post. There, he worked in a doorknob factory, laid asphalt, and starred in commercials for jeans and candy bars while auditioning for traditional acting roles. He appeared on the soap opera Another World a couple of years before landing his breakout role; In October 1990, on his 24th birthday, the actor made his debut as teen heartthrob and bad boy Dylan McKay on the series Beverly Hills, 90210, where his character romanced Brenda, played by Shannen Doherty, and her BFF Kelly, played by Jennie Garth. The show achieved cult status and ran for 10 seasons. "After the pilot, we felt there should be someone who is a little dangerous, a little on the edge, and we came up with the Dylan character," late series producer Aaron Spelling told Rolling Stone in 1992. "When Luke walked into the audition, it was like 'Wow, that's the person,'" creator Darren Star told the magazine. "He seems exactly like James Dean to me, but it isn't a conscious imitation—he's really being himself." In 1992, he starred opposite Kristy Swanson in the movie Buffy the Vampire Slayer, which later inspired a hit series neither actor was part of. Swanson and Doherty both paid tribute online to Perry on Thursday after news of his stroke was made public. Also in the 1990s, Perry did some voice acting, portraying characters on shows such as Mortal Kombat: Defenders of the Realm and Biker Mice From Mars. In 1994, the actor played 1987 PRCA Bull Riding World Champion Lane Frost in the movie 8 Seconds. In the early 2000s, Perry starred on the short-lived post-apocalyptic series Jeremiah and also played the recurring role of Reverend Jeremiah Cloutier on the HBO prison series Oz. In 2005, he reunited with Garth on a few episodes of her sitcom What I Like About You. Over the next few years, he would go on to appear on shows such as Windfall, John From Cincinnati, Criminal Minds, Law & Order: SVU, FCU: Fact Checkers Unit, Body of Proof, Hot in Cleveland, and Ties That Bind. In 2015, Perry had a cancer scare after a colonoscopy revealed precancerous growths. He then became an advocate for the group Fight Colorectal Cancer campaign. For the past two and a half years, Perry has played Archie's father, Fred Andrews, on the hit CW series Riverdale. Some of his co-stars from the show also paid tribute to him after hearing about his stroke. The actor recently filmed a role in Quentin Tarantino's film Once Upon a Time in Hollywood, which also stars actors such as Leonardo DiCaprio, Brad Pitt, Al Pacino, Kurt Russell, Margot Robbie, Dakota Fanning, Rumer Willis, and Damian Lewis.